I decided to treat myself to some skincare goodies which I have been lusting over for quite some time, which meant a rather expensive order being placed with Cult Beauty, my first one! One of the items that has been on my wish list for some time, is the Oskia Renaissance Cleansing Gel, which is popular with many of the big beauty bloggers; I first came across it from reading Vivianna Does Makeup a couple of years ago. I’ve mentioned in previous posts that I’m investing in my skincare, as opposed to my makeup, as I came to realise that if my skin isn’t healthy and well looked after, my makeup is not going to look good over the top. From my recent re-organisation of all of my products, I’ve realised that the majority of my stash is skincare related so I’m heading in the right direction. 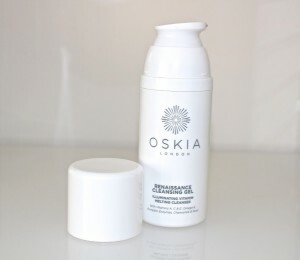 The Oskia Renaissance Cleansing Gel comes in a 100ml container with a pump attached, which is a big plus point for me, as it means it is hygienic, as well as dispersing the appropriate amount of product per pump; ensuring both the quality and longevity of the cleanser. As the name suggests, the product is a gel, which smells of Rose Chamomile and peach in colour. I don’t usually like rose but I don’t mind the scent from this. The cleanser has lots of lovely ingredients to illuminate your skin; pumpkin enzymes to exfoliate, vitamin A to improve skin damage, vitamins C and E to restore and protect skin, starflower oil, magnesium and vitamins B2 and C which is said to promote firmness as well as Oskias key ingredient; MSN which soothes skin and reduces any inflammation. · Apply the gel to dry skin, including your eye area. The gel immediately melts into an oil, upon contact with the skin. · Once massaged all over your face, add a splash of water which will emulsify the product ever so slightly. I initially expected to see a lot of bubbles, but it was barely noticeable. · To remove the product use a hot cloth. I’ve been using the cleanser either AM & PM or just PM. I’ve found that this removes all of my makeup, including eye makeup. My skin feels completely clean, without the tightness or dryness you get from using some cleansers. It’s just a really nice product which feels gentle on my skin. There is no residue left after using the gel, which is another plus point for me. The cleanser is priced at £28 for 100ml, which may seem like a lot, but considering the ingredients list, I think you’re getting a lot for your money. You only use a small amount of product too. I must admit that I haven’t seen any major changes in my skin as a result of using this, which I thought I would with the hype surrounding it. If anything my skin feels less dry, yet there is no greasy residue which you sometimes get with moisturising products, which I do think is great. The Oskia Renaissance Cleansing Gel is in the Top 10 cleansers from Cult Beauty, have you tried it? Great, honest review! I have wanted to try this for a while but after reading this, I think I will pass. Have you tried the Liz Earle cleanse and polish?